Bamboobies Super Soft Washable Nursing Pads - 3 Pair Ultra-Thin Regulars (Pale Pink) & 1 Pair Thick Overnight (Light Blue). All of Bamboobies Nursing Pads have Milk-proof backing to prevent leak-throughs! 3 Sets Bamboobies Reusable Nursing Pads Leak-Proof Overnight. 2 Sets Ultra Thin Reusable Heart Shaped Nursing Pads. Breastfeeding is beautiful - but leaks and lines are not! Bamboobies ultra-soft nursing pads are unique because they don't leak through like other washable pads. Overnights are made for heavy leaking and newborn nursing and are made with a unique milk-proof backing to stop embarrassing leaks. Unlike circular cotton pads, regular Bamboobies heart-shaped pads are less visible through your shirt and don't feel cold and clammy when wet. Regular nursing pads: These are ultra-thin and heart-shaped. Bamboobies Washable Reusable Nursing Pads with Leak-Proof Backing for Breastfeeding, 3 Regular and 1 Overnight Pairs. 6 circle pads 2 heart pads ultra thin. 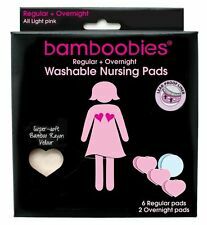 Bamboobies Washable Nursing Pads. Ultra soft bamboo rayon velour soothes tender skin. Machine washable and dryable! Fiber content.